All orders are shipped within 48 hours. Orders are shipped by FedEx Ground or U.S. Postal Service and are usually received within 7-10 business days from the date you placed your order. 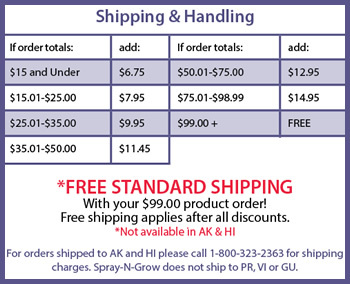 For orders shipped to Alaska and Hawaii, please call 1-800-323-2363, Monday through Friday, between the hours of 8:00 a.m. and 5:00 p.m. CST for shipping charges. Expedited shipping is available for an additional fee. If you would like us to ship your order expedited, please order by phone 1-800-323-2363 Monday through Friday between the hours of 8:00am and 5:00pm CST. Thank you for your interest in our products. At this time we do not ship orders to countries outside the Continental United States. Spray-N-Grow products are available through our distributors in the UK and The Netherlands.